Once we had our ice cream and, if we were lucky, snagged a table on the porch, I’d realize how cold I was. Why is it that one always feels cold after a day at the beach, once the sun goes down? There’s also a profound exhaustion that hits—a pleasant one, but a profound one. I’d put on my mom or dad’s coat, or I’d ask to take our ice cream to the car, where my eyelids would stay open just long enough to get through the last bite. That “real” pistachio ice cream, and others I’ve had over the years, though, probably wasn’t as real as I thought it was. It surely didn’t have any funny ingredients or food colorings in it like the green kind, and it didn’t taste like nut-studded cotton candy, but the base was most likely flavored not with pistachios. Instead, most “white” pistachio ice creams, as they’re often called, are enhanced with the esters of another nut: almond. Usually, a sweet cream base pointed up with almond extract is what holds those soggy, untoasted chunks of what you payed for. This isn’t incriminating; pistachios are damn expensive. And the almond extract base is what Americans have come to know as pistachio. Here, though, we have the real thing. Like Italian pistachio gelato, it’s flavored only by the flesh of its namesake (though some use expensive specialty pastes). A long steeping and chilling time results in a super-nutty ice cream that tastes rich and warm like toasted nuts and not light and floral like the extracts most are used to. And it requires lots of pistachios, none of which are mixed in. So if it doesn’t taste like shop-bought pistachio ice cream, it’s because it isn’t. 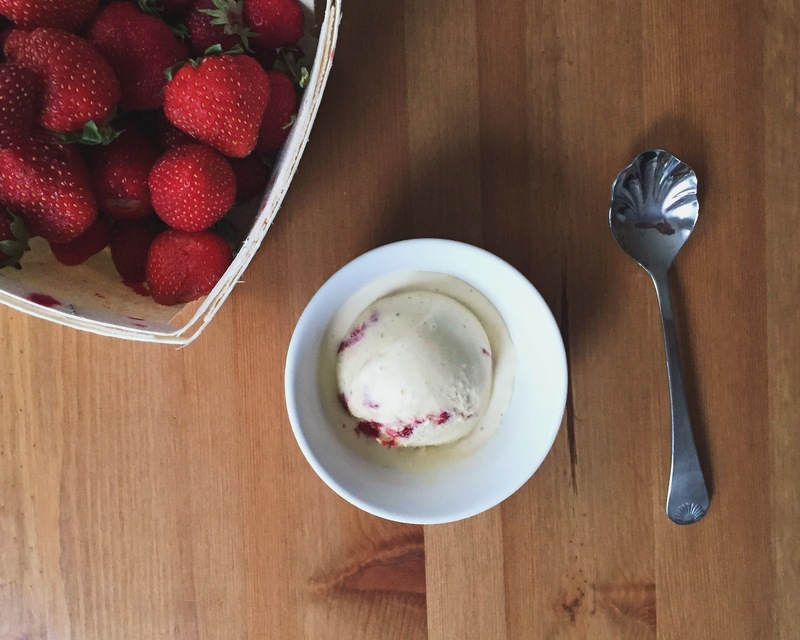 To cut the nutty richness, there’s a swirl of my favorite fruit of the season—strawberries—roasted until they take on a savory depth. 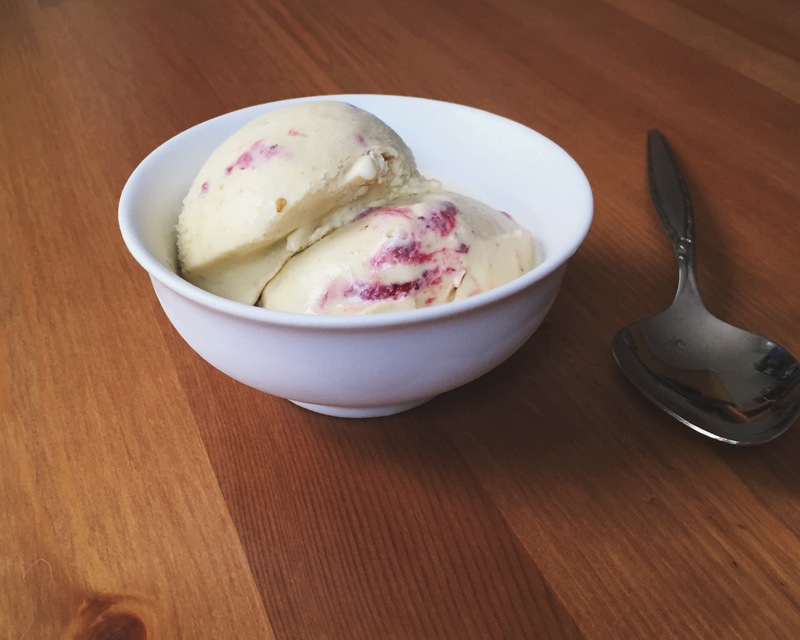 Despite measures to keep the fruit pulp soft (roasting, adding vodka), the swirl still gets a tad frozen, providing a balanced ice cream: rich, dense, custardy, almost chewy (definitely Boston-style) ice cream and bright, refreshing, fruity, and tart sorbet-like swirl. The Hyannis shop’s name changes (and I’m guessing, ownership changes) occurred as my family was growing out of mid-Cape, preferring to travel farther down the coast and eventually northward, to places like Ogunquit, ME. There’s a popular song by the indie pop/rock band Vampire Weekend called “Walcott,” in which Ezra calls Hyannisport a ghetto. A ghetto it is not, but it is not all that, hm, picturesque. We’d walk and walk down Main St., passing the magic stores, XXL tee-shirt shops, and “etc.” stores filled primarily with two things: key chains and tawdry shot glasses. Yes, we were walking off dinner, enjoying the evening, but it was all just necessary suffering for our frozen reward. So many of my Cape memories are sensory: the smell of our hotel’s liquid hand soap, the damp feeling on my skin when walking through the humid indoor pool area, and the satisfying whack of the pinball in the machine I’d play for hours with my mother; the crunch of sand in my tuna and pickle sandwiches and the sound of seagulls as they ran to come eat them; the sticking and scraping of my boogie board beneath my bare wet legs; the tooth-breaking crunch of the deeply toasted and pressed bagels at the Hearth and Kettle across the street at breakfast. But the first lick of a scoop at Maggie’s is one of my fondest, and I remember it every time I eat pistachio ice cream. With this recipe, it might happen a lot more often. I recommend buying pistachios in the shell. They seem to have the best flavor. 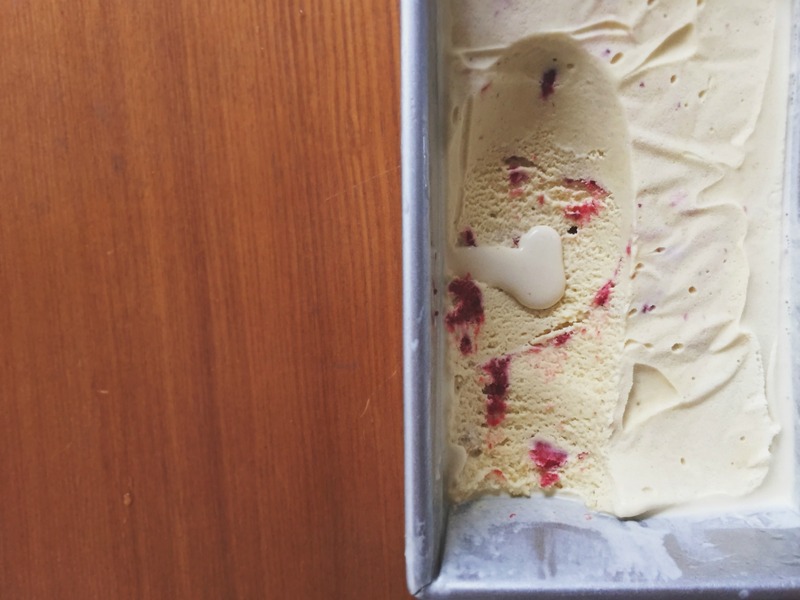 I like to store the ice cream in a loaf pan for long swirls, but it will also work in an airtight container; you just may have to adjust the number of layers to better suit your vessel of choice. To avoid spending a fortune on nuts or skimping on quality, this recipe makes less ice cream than most. It’s rich and a small scoop hoes a long way but feel free to scale up the recipe. 1. For the Ice Cream: Pulse pistachios in food processor until finely chopped, 15 to 20 pulses. Transfer pistachios to fine-mesh strainer set over bowl and shake to separate pistachio dust. Combine finely chopped pistachios, cream, and milk in small saucepan and bring just to boil. Remove pan from heat, cover, and let sit for 45 minutes. Transfer pistachio mixture to airtight container and refrigerate for 6 to 8 hours. 2. Strain pistachio mixture through fine mesh strainer in batches (nuts will have absorbed much of liquid), pressing on nuts with rubber spatula to extract as much liquid as possible (be patient!). You should have about 11⁄3 cups of liquid. Place spent nutmeat in cheesecloth or paper towels and squeeze any bit of liquid left. Transfer liquid to large saucepan, add sugar and salt, and bring just to boil, whisking to dissolve sugar. Meanwhile, place 230 grams (1 cup) heavy cream in medium bowl with strainer set on top. Whisk egg yolks together in large saucepan. Set up ice bath in large bowl. Pour small amount of hot milk mixture into egg yolks, whisking constantly, to temper, then slowly whisk in remaining milk mixture in steady stream. Cook mixture whisking constantly, over medium heat until line drawn down custard-coated spoon holds and custard registers 170-175 degrees. Pour custard through fine-mesh strainer into cream and whisk to combine. Transfer bowl to ice bath and whisk occasionally until mixture reaches room temperature. Cover bowl with plastic wrap, transfer to refrigerator, and let chill for at least 6 hours or up to 24 hours. 3. For the Strawberry Swirl: Adjust oven rack to middle position and heat oven to 375 degrees. Toss strawberries with honey in large baking dish and roast strawberries, tossing every 15 minutes, until strawberries are soft and juices are bubbling and caramelized and so thick they barely run. Transfer strawberries to bowl. Mash strawberries with fork leaving some pieces of fruit. Cover bowl with plastic and refrigerate until ready to use. 4. Stir vodka into chilled pistachio custard. Churn ice cream in ice cream machine according to manufacturer’s instructions, 15 to 25 minutes. Meanwhile, stir vodka into strawberry mixture. 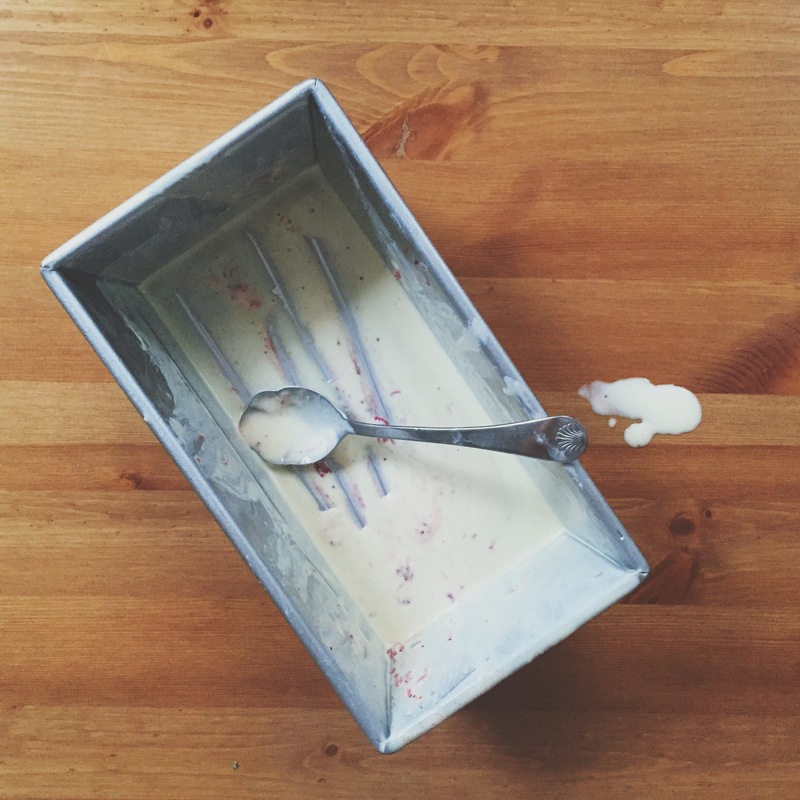 When ice cream is done, working quickly, transfer one-third to loaf pan or container. 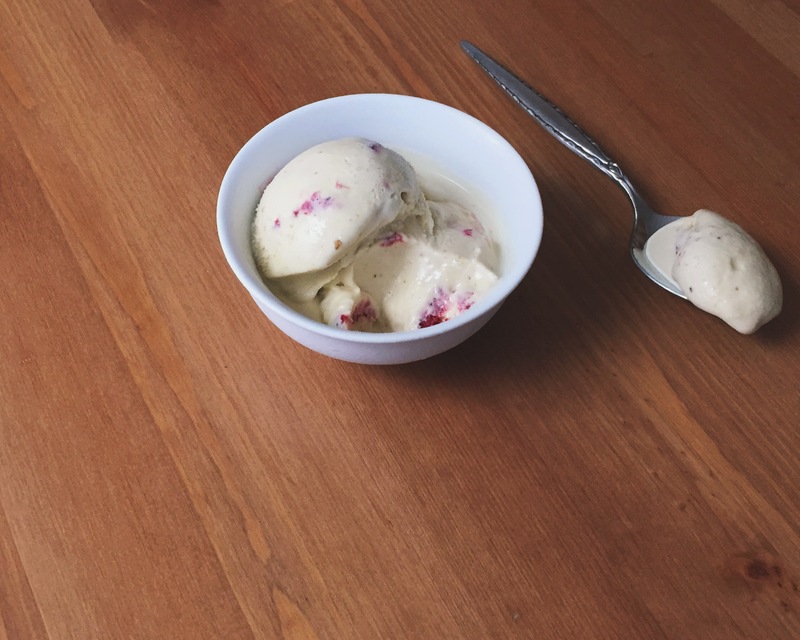 Spoon dollops of strawberry mixture with a bit of space between them over ice cream. Cover strawberry mixture with half of remaining ice cream. Dollop with strawberry mixture again and cover with remaining ice cream. Cover and freeze for at least 3 hours before serving. Oh, I love this! I love the whole post, and the fact that also you were able to photograph ice cream!!! Well, that’s just about perfect. Love the memories, and the ice cream looks/sounds absolutely delicious. Both my parents love pistachio ice cream and so do I! 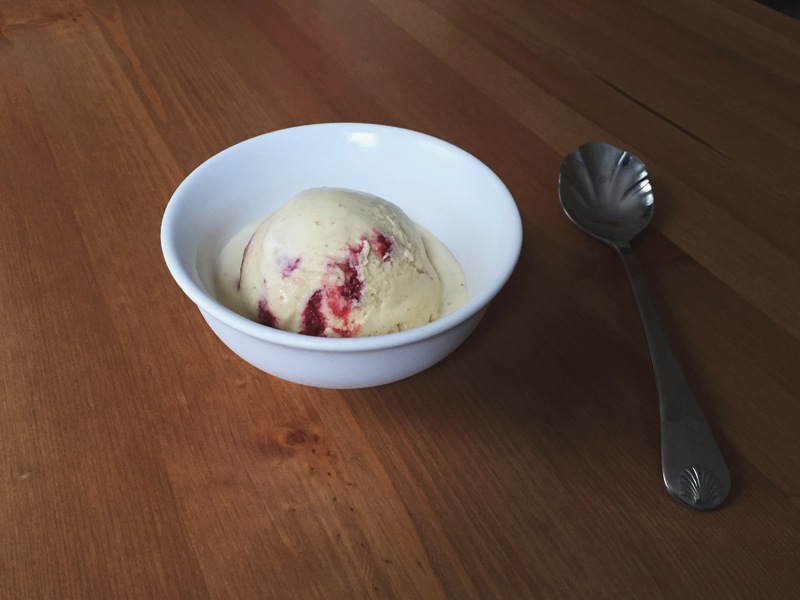 What a great idea to add a roasted strawberry swirl. I wish I had a scoop of this right now!